Till 29 Feb 2016 comGateway: 18% OFF Your First Shipment from U.S.
www.comGateway.com is your gateway to shopping at over 1,000,000 U.S. online stores, shipping globally to over 220 countries worldwide. 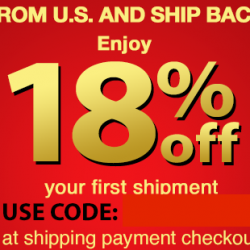 You can now shop from your favourite U.S. online stores and get 18% off your first shipment with comGateway! Promo ends 29 February 2016, so shop now to get your purchases before CNY!